My Caturday post is a follow up to this mornings post. Last year walking out of the El Paso TX Petro truckstop, I stumbled upon a feral colony. I stopped in here today to see if they would still be here. To my surprise, several are still here. A Tort & the Orange Tab look like they may be the same ones from last year. They were just young 4-6 month old kits then. They also put in a dog play area. I am so glad to see Petro being pet friendly. I plan on leaving a Thank You review on their web site. And I will ask them to look into rescue options for these ferals. 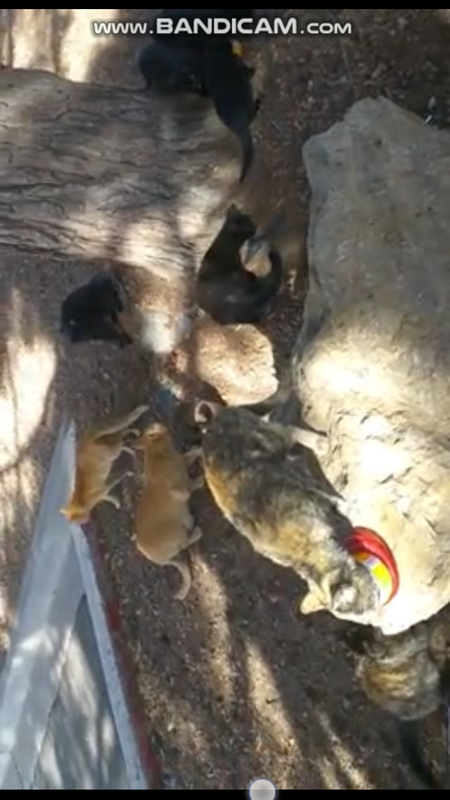 Such a dangerous place for these cats to be. High traffic area. Breaks my heart to see them living this way. On one hand I'm glad there are kindly people who stop and give them some kibble; clearly they are not scrawny and emaciated... on the other hand, that's a really dangerous place for them to be; pretty sure that's right up against I-10. Done. I sent them a long message on the contact part of that site. Complete with links to those 2 vids i posted of them. I wanted to let you know that Sun City got back with me. That Feral Colony in El Paso was TNR'd late last year. Non were Socially Friendly enough to go on the adoption list I was told. And they had no other options on the replacement to the same location. Only half of the colony is still there. None were kittens, So the TNR is working. But it breaks my heart to see these Cats in such a "Bad Spot". D-tube isn't coming in for me but I also hate to see animals go uncared for. Howdy sir krazzytrukker! look at those guys..that one behind the ice machine was quite wary wasn't he? That dog park is super cool too! I wonder how many people stop and feed them? Hi @krazzytrukker and thank you for entering (and being entered) into the "For the Love of Comments" contest. You have been selected to receive a Steembasicincome share.